This little trick is probably very widely distributed; it has been observed among the Omahas, the Pawnees and the Kwakiutls; the Japanese, and the Caroline Islanders. Dr. Boas informs Dr. Haddon (see American Anthropologist, v, 1903, p. 218) that there are two shamanistic societies among the Kwakiutls, and that this trick is used to identify the members of one of these societies when they meet in the forest. The members of the other society are recognized by another trick, which, since it requires the use of a stick, does not fall within our subject. 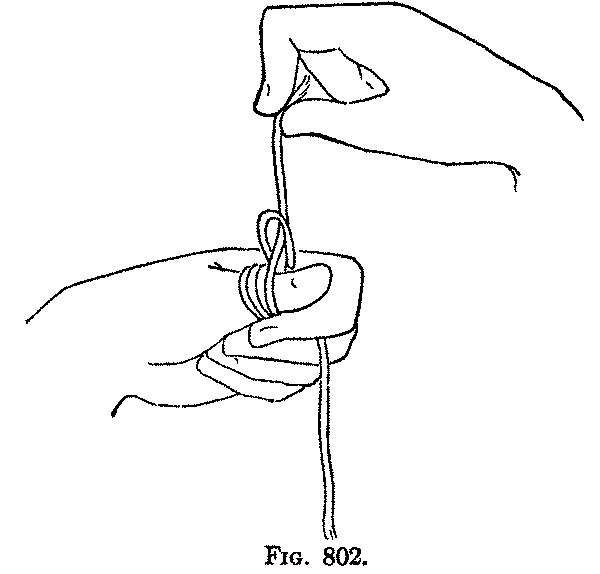 The trick has also been described from Argyleshire by Dr. R. C. Maclagan (p. 189) as the "thumb loop." First: Take a piece of string about eighteen inches long, and, holding it at the middle between the tips of the right thumb and index, wind a portion of one-half of it around the left thumb, toward the body above the thumb, and away from the body under the thumb, the left hand being held with the thumb and index pointing to the right. 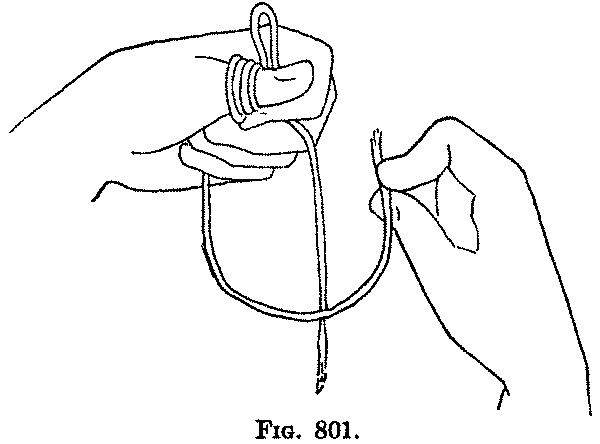 Second: In the part of the string which you have been holding between the right thumb and index make a small loop and place it between the tips of the left thumb and index, so that it stands erect; hold it there and remove the right thumb and index. Third: Pick up between the tips of the right thumb and index the end of the other half of the string, which is hanging down from the far side of the left thumb, then draw it to the right (Fig. 801). Now make several passes with the right hand as if you were trying to thread the end of the right hand string through the erect loop held by the left hand; finally pass the right hand to the left over the left hand, apparently threading the loop, but really drawing the part of the string which hangs from the right hand, between the left thumb and index as far as you can (Fig. 802). The loop, which is still held by the left thumb and index, appears to have been threaded by the right hand string.